New members must be proposed and seconded by existing Club members. For more information or in case of difficulty, contact our Membership Secretary, Jacqui Price - her details are on our Contacts page. Please note that Junior members are warmly welcomed but do not have voting rights. Details of the different types of membership can be found on the application form. Reduced fees when entering Club shows or working tests. A Championship Show is held each April at St. Helens, Merseyside and an Open Show is held in September at the same venue. We also hold a further Championship Show jointly with the Newfoundland Club at the Kennel Club Building, Stoneleigh Park, Warwickshire. 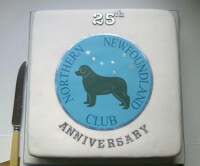 The organization of the Joint Clubs Championship Show alternates between us and the Newfoundland Club and in 2014 it will be our responsibility. Details of our shows can be found on our calendar page. All of the Clubs activities and events are intended to be social occassions too but there are specific times, such as the Club's annual Christmas Dinner Dance, when we leave our beloved newfies at home and get together to relax and enjoy each others company.